Now that you have the landscaping of your dreams, you spend more time than ever outside. Why should the fun end when the sun goes down? 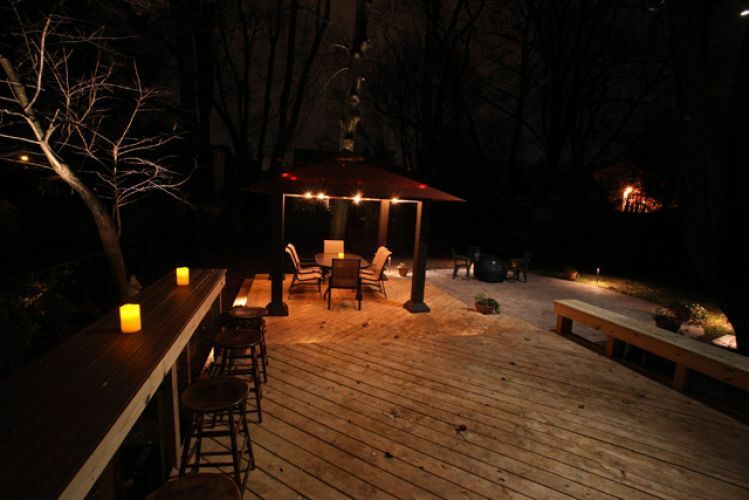 With the right exterior lighting, you can use your deck or patio much longer. That means more bang for your buck. You can use your new outdoor kitchen and dining areas even in the autumn months when the daylight hours dwindle. For functional space, we like to install plenty of “downlighting.” That’s lights installed higher up pointed downward. We can install downlighting in patio ceiling fixtures, your home’s eaves or nearby trees. If you’ll be cooking or dining outside, you want plenty of light from several angles to see what you’re doing. Want to unwind with a glass of wine in your hot tub on your new deck? You need mood lighting! We install a huge variety of deck lighting, fit for any style deck. For decks, we usually use low-voltage lights installed under railings, into fence posts and under stairs. They create a peaceful glow that envelops your deck. Your hot tub or seating area will welcome you with serenity. The radiant tranquility will melt your cares away at the end of a long day. 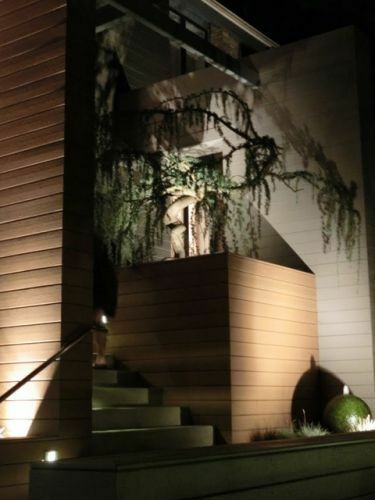 Uplighting bathes your plants and landscaping in warm light and makes interesting features pop out. A tree with a low branching structure like a crepe myrtle would cast playful shadows with uplighting. Ornamental bark like that of a Japanese Stewartia really bursts into view with a well light dug into ground level next to it. You might not be able to make it out otherwise! 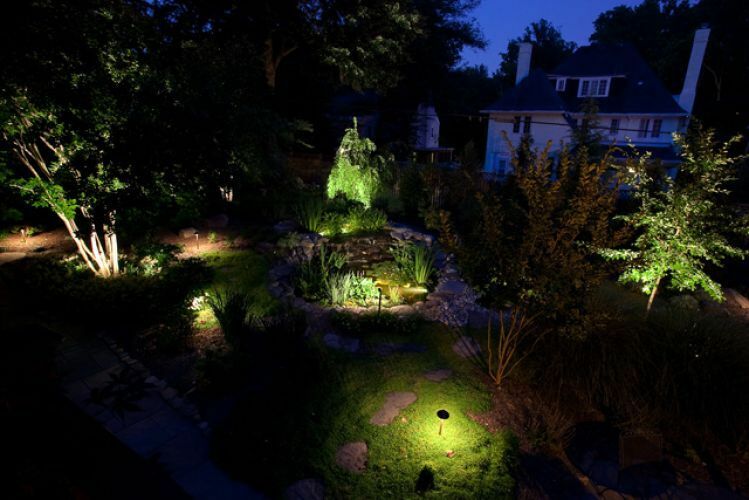 If you have features like a waterfall or fountain, landscape lighting can heighten the elegance. A directional uplight on a short post pointed at a fountain makes it an imposing structure that dominates a dark landscape. Your new outdoor tableau has obvious high points that need to take center stage. That flower garden you tend to every weekend. Your gorgeous arbor entrance that entices visitors. The koi pond where guests can admire the peaceful inhabitants. When you need to draw attention, we can install spotlights that break through the clutter. Exterior spotlights direct the eye right where you want it to go. You’ve got a vision for your yard, it needs to be shown off. When your landscaping vision comes together, it’s like your very own work of art. All the pieces are lovely alone, but as an interconnected whole, they dazzle. Moonlighting makes that connection. It defines the space like the frame of a painting. We perch a light facing downward high above the area but hidden from view from most angles. The effect is just like the name; your landscape looks like it’s swaddled in light from a bright full moon on a clear night. Moonlighting generates natural shadows that will make your scenery look like an oil painting. Your yard may look its best when the sun goes down! When you’ve got a landscape begging to be enjoyed at night, you need to mitigate its hazards. We offer an array of options to keep you and your guests safe. Moonlighting can give you a clear look if you only have a small path that you’ll use at night. For longer walkways, low-voltage lights on small posts next to the trail will keep you and your guests on the right path. These path lights project canopies of illumination, gently guiding you along, and you won’t need to worry about losing your footing in the dark. If your patio, deck or landscape includes a certain number of stairs, you’ll need stair lighting. Building codes require it. Good news: If we built your patio, deck or stairs, we’ve already accounted for lighting required by codes. But if you had another contractor build something not up to code or you want to make an aesthetic change, we are here to help. Our electricians know code backward and forward and can set you up with something that keeps the inspector off your back. We at Johnson’s sometimes have a flair for the dramatic. 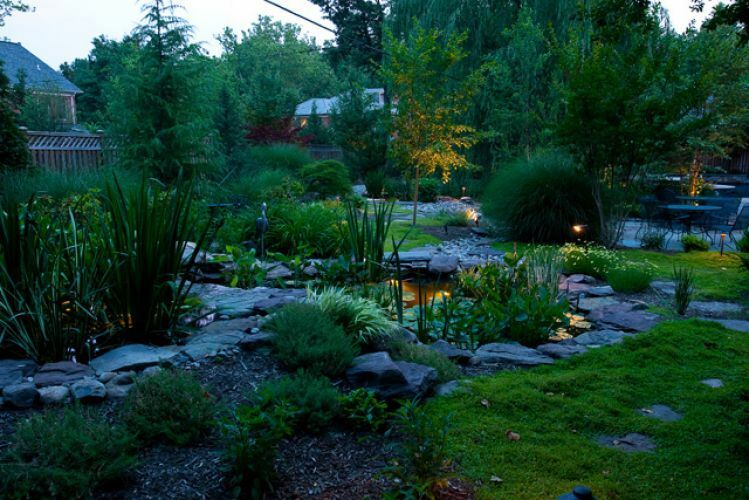 Our landscape designers have over a century of combined experience. So they know when to take a big shot. Backlighting is a big shot. Backlighting means putting light behind a form you want to stand out in stark relief. If you have a tree with a beautiful profile, backlighting puts that profile front and center. Backlighting works especially well if the subject is near a wall, where the light can reflect off the surface. Imagine a column of light extending up to your eaves behind a striking fountain, a bold statement of landscaping confidence. 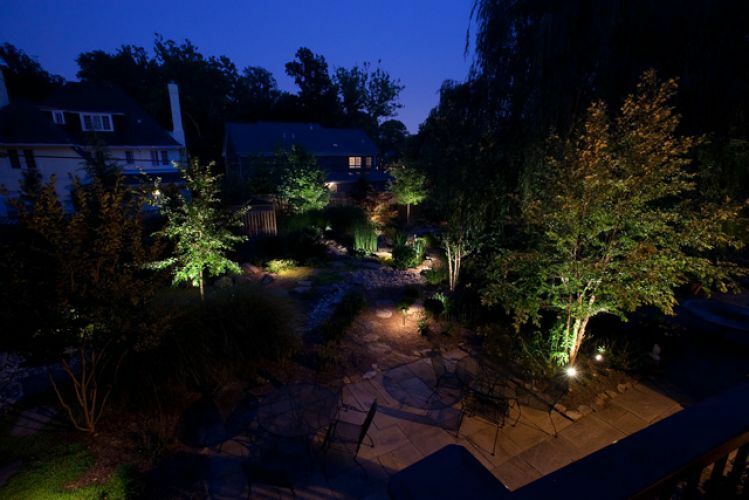 Our lighting division does more than beautify your landscape. 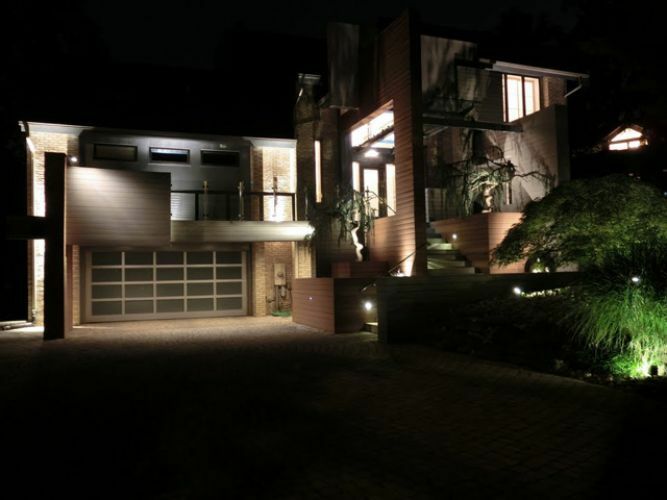 We also know that lighting can serve as the foundation of your home’s security. Our advanced systems can keep your exterior with lit, deterring potential intruders. Thieves look for the easiest targets they can find. We design outdoor lights so they leave no shadows for burglars to hide in. Once a would-be criminal sees how exposed they would be in the approach to your home, they’ll go searching for an easier target. Lights can also scare off pesky animals encroaching on your property. When they turn on, you’re likely to notice inside, so you can check on the activation quickly. A well-lit home is a home safe from burglars. Exterior walls pose an opportunity to splash color across your outdoor space. 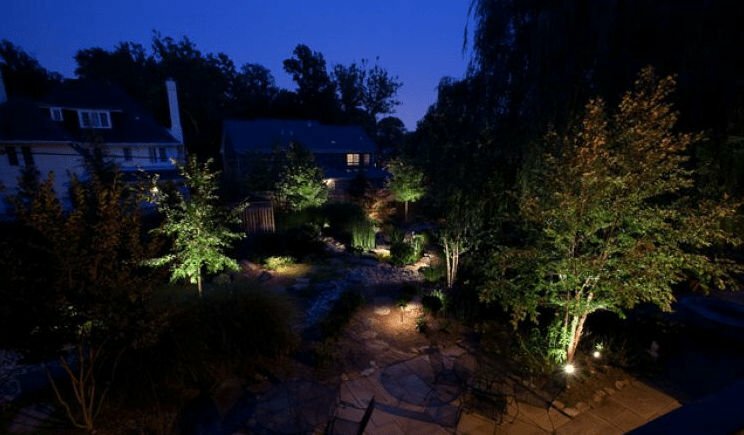 With tinted light bulbs, we can set the dominant color of your landscaping. Lighting pointed right at your walls injects jets of your chosen hue into your design. It’s hard to go wrong with this technique. Color selection depends on the mood you want to set. A regal purple would lend a touch of formality to your gardens, while a soft green sets a relaxing tone for your patio. Lights around your pool means you can add night swimming to your repertoire. Pools in the dark can pose too much of a danger. With the right illumination, you can be sure of your footing in and around your pool.